^ The poison from a kasa tree was used to determine whether or not a person was a witch. According to biographer Charles-André Gilis, the test occurred on the day of Kasa-Vubu's birth. ^ No official reasoning was ever given for Kasa-Vubu's expulsion, though Gilis and Kasa-Vubu's daughter, Justine, attribute this to his alleged commitment to an academic pursuit of justice that ran afoul of his teachers' ideals. ^ Morris 2006, p. 157. ^ Biographie belge d'outre-mer 2015, p. 218. ^ Biographie belge d'outre-mer 2015, pp. 217–218. ^ a b c d e Biographie belge d'outre-mer 2015, p. 219. ^ a b c d e Reuters 1969. ^ Biographie belge d'outre-mer 2015, p. 220. ^ a b c d Tanner 1961. ^ Covington-Ward 2012, p. 75. ^ a b Kisangani 2009, p. 265. ^ Hoskyns 1965, p. 79. ^ Hoskyns 1965, p. 83. ^ Bonyeka 1992, pp. 248–249. ^ Hoskyns 1965, p. 198. ^ Doyle 2006, p. 175. ^ Rich 2012, p. 304. ^ Loffman, Reuben (22 June 2017). "From Mobutu to Kabila, the DRC is paying a heavy price for autocrats at its helm". The Conversation. Retrieved 18 January 2018. ^ Covington-Ward 2012, p. 73. ^ "Les discours du 30 juin 1960: Roi Baudouin , Pdt Joseph Kasavubu et le 1er Min. Patrice Emery Lumumba | Radio Tele LAVDCONGO". Bonyeka, Bomandeke (1992). Le Parlement congolais sous le régime de la Loi fondamentale (in French). Kinshasa: Presses universitaire du Zaire. OCLC 716913628. Covington-Ward, Yolanda (January 2012). "Joseph Kasa-Vubu, ABAKO, and Performances of Kongo Nationalism in the Independence of Congo". Journal of Black Studies. 43 (1): 72–94. doi:10.1177/0021934711424491. ISSN 0021-9347. JSTOR 23215196. Doyle, Michael W.; Sambanis, Nicholas (2006). "Chapter 4: Making War". Making War and Building Peace: United Nations Peace Operations. Princeton, New Jersey: Princeton University Press. pp. 144–196. ISBN 978-0-691-12275-5. LaFontaine, J.S. (1986). City Politics: A Study of Léopoldville 1962–63. American Studies. Cambridge University Press Archive. 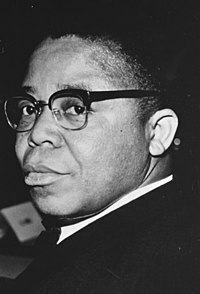 "Joseph Kasavubu Dies in Congo; Was His Nation's First President" (PDF). Reuters. 24 March 1969. Retrieved 19 August 2014. Kisangani, Emizet Francois; Bobb, Scott F. (2010). Historical Dictionary of the Democratic Republic of the Congo (3rd ed.). Plymouth, UK: Scarecrow Press. ISBN 978-0-8108-5761-2. Retrieved 19 August 2014. Morris, Brian (2006). Religion and Anthropology: A Critical Introduction. Cambridge University Press. ISBN 9780521852418. Rich, Jeremy (2012). "Kasa-Vubu, Joseph (1915–1969)". In Akyeampong, Emmanuel Kwaku; Gates, Henry Louis (eds.). Dictionary of African Biography. 3. Oxford, England: Oxford University Press. pp. 302–304. ISBN 978-0-19-538207-5. Tanner, Henry. "The Patient African – Kasavubu" (PDF) (26 February 1961). New York Times. Retrieved 19 August 2014. Kasa-Vubu, Justine M'Poyo (1997). Kasa-Vubu et le Congo indépendant: 1960–1969. Brussels: Le Cri édition. ISBN 9782871061854. Kasa-Vubu, Justine M'Poyo (1985). Joseph Kasa-Vubu, mon père: de la naissance d'une conscience nationale à l'indépendance. Brussels: Éditions de Chabassol. OCLC 17233037.